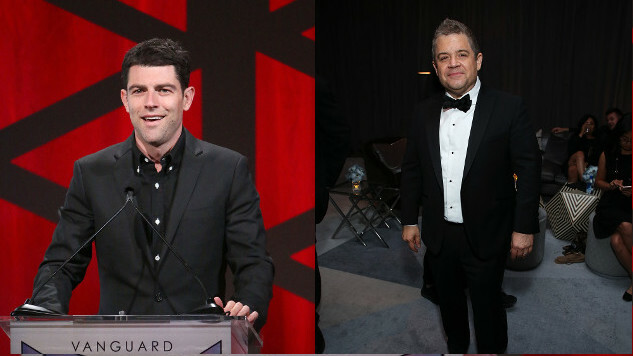 Max Greenfield is returning to Neptune, Calif., joined by series newcomer Patton Oswalt in Hulu’s forthcoming Veronica Mars revival, per Deadline. Greenfield recurred in the first three seasons of the cult series as Leo D’Amato, the Sheriff’s Deputy in Neptune. He also appeared in the fan-funded 2014 Veronica Mars feature film, this time as a detective at the San Francisco Police Department helping Kristen Bell’s Veronica in the investigation of Susan Knight’s murder. Oswalt will appear in a recurring role as Penn Ephner. On the wrong side of 40 with “best pizza delivery guy in Neptune” as his only claim to fame, Penn’s passion is true crime, and he frequently posts on unsolved murder websites. As spring breakers are getting murdered in the revival, Penn looks to milk his 15 minutes of fame for all it’s worth. New Veronica Mars cast additions also include Kirby Howell-Baptiste and Dawnn Lewis. The revival follows Veronica after one of the victim’s parents hires Mars Investigations to find their son’s killer. Veronica is drawn into an epic mystery pitting the enclave’s wealthy elites, who want to end spring break in the tourist town after the murders, against the working-class locals who rely on the influx of new cash during this season. Veronica Mars creator Rob Thomas is writing the first episode of the revival, an eight-episode Hulu limited series. He is is executive producing with Bell, Diane Ruggiero-Wright and Dan Etheridge. Spondoolie Productions produces in association with Warner Bros TV. The Veronica Mars revival is scheduled to premiere on Hulu in 2019.